Snow in March got you down? Not feeling lucky this St. Patty’s Day? Our April attendance challenge is the perfect thing to turn things around and create your own luck!! See Wednesday’s post for more details and sign up today!! We’re in need of a few CFers to volunteer for the AOIB on April 1st. The event will run from about 8 AM – 1 PM, and will be a fun time encouraging some awesome athletes and seeing some incredible feats of athleticism! A bunch of other local gyms are participating, so it’ll be a great way to meet some others who share your passion for fitness. If you’re in, sign up at the front desk today! Speaking of volunteering, judging the CrossFit Open workouts is a great way to sharpen your skills at recognizing good and bad movements / reps. This week’s workout is a 13-minute time cap of 4 exercises everyone is familiar with. If you’ve got 13 minutes to spare after tonight, Saturday 9:15, Sunday, or Monday’s PM class, please stick around! And a reminder: you don’t have to complete the CrossFit judge’s course to judge competitors this year! Snow in March, just a few days before spring’s arrival, gotcha down? We have the perfect thing to help get your mind off of it….A CHALLENGE! This is a challenge ANYONE can do. It’s an Attendance Challenge. 1. Runs the entire month of April. 2. Must Pre-enter the challenge before the start of the month by signing up at front desk. It’s a very simple challenge, and will result in a huge reward for a lucky challenger! Sign up to commit! Nothing to lose here folks! Our “Motivate a Friend” event began Saturday 2/11 and goes through Wednesday 2/15. Bring any or all friends who you have been wanting to expose to CF – now is the time! It goes without saying, but if you’re in a class with a newbie, remember to introduce yourself and show / represent what CF is all about! If Target is doing it, then so are we! Stores are getting ready for the Fall and Back to School, and we need to make way for some cool new Fall/Winter apparel and gear too! We are having a Flash Sale beginning Thursday, July 28th at 6:30AM and ending Monday, 8/1 at 6:30PM. All items are at 50% off, which is equal to an $11.00 sale price. OR, you can mix and match to purchase 2 items for $20.00! The weather is hot, but those deals are even HOTTER! Get them before they run out! A few updates while you’re enjoying your margaritas today! THIS SUNDAY May 8th is Mother’s Day – All moms workout for FREE this week! For those of you who don’t know, the Owens family is moving to Florida very shortly :(. Please join us after the 9:15 AM CrossFit class THIS SATURDAY May 7th to send them off CF-style! We’re rolling out a new pricing schedule for our teacher members! Check out the top of CF’s fees page for more information! With summer fast approaching, what better way to stay in shape for keeping up with those kids than to participate in CF? Try out a new class time, meet new CFers, stay in shape… what more could you ask for?? See yesterday’s post for summer kids class information! Did all those pullups this week remind you of something? MURPH is coming! A HUGE thank you to Rob and Kim R for sponsoring the Murph Challenge at Corps Fitness again this year! Check out the previous blog post for details on how to sign up online (if you want to) and when / how we’re running it at CF. You don’t have to sign up on the Murph website to participate in the workout – just show up for class on the 28th (ONE CLASS THAT DAY, 8:30 AM). This is a mega workout, so please make sure you are physically (and mentally) prepared. Scale if you need to. Listen to your body. Don’t get rhabdo! – CFers, join us for a CFer social hike up to the Pinnacle in Hamburg next Sunday May 15th. Meet at CF ready to leave at 8:30 AM, or meet in the reservoir parking lot by 9 AM. Rain date TBD if necessary. Out and back hike, approximately 7 miles, slow pace, plan for it to take most of the day / returning early to mid afternoon. Next Intro to Corps Fitness class will be Saturday 5/14 at 9:45 AM with Chris. Come on by and the take advantage and participate in our incentive program! Sunday 9:30 AM – Skills is no longer on the schedule. A HUGE thank you to Rob and Kim R for sponsoring the Murph Challenge again this year! Check out Tuesday’s blog post for details on how to sign up (if you want to) and when / how we’re running it at CF. You don’t have to sign up on the Murph website to participate in the workout. This is a mega workout, so please make sure you are physically (and mentally) prepared. Scale if you need to. Listen to your body. Don’t get rhabdo! – Sunday May 8th is Mother’s Day! All moms workout out for FREE! – Have you done the Kaag Challenge yet? You’re in for a real treat 😉 We’re extending it indefinitely, so be sure to get in touch with Chris or Melissa for a time slot! If you have already completed the Kaag Challenge, remember to stop by the front desk for an IM ABLE t-shirt! – A reminder to check out the CF Loyalty Program and Incentives we announced April 1st. You can also earn points via membership and merchandise purchases! Check out the link for full details, and start earning today! – For newbies looking to take advantage of the incentives, remember you must attend an intro class first. After that, you’re be eligible for 2 weeks of free membership and then an additional month at $70. – REMINDER: Saturday class times are now 8 AM (Corps Fitness) and 9:15 AM (CrossFit). – There is no longer spin / krank class on Saturdays. – Starting next week (5/4), Lisa’s Wednesday spin / krank is on hiatus for the summer. A great way to get in some zero-impact base mileage, especially on rainy spring days! Sunday 9:30 AM – Owen (open time and CrossFit skills) Skills is no longer on the schedule. Did you do your taxes yet?? Sometimes adulting is no fun… But sometimes it is, like when you come to CF and get to play with all of your friends! Save a night of cooking dinner, and contribute to a great cause! Texas Roadhouse is holding a fundraiser dinner from 5-10 PM TONIGHT. Stop in and support a great organization and our fallen hero! You must bring along a copy of the flier to be able to contribute to the fundraiser – TRS holds a copy of the flier with your receipt when you pay. Join Senator Judy Schwank at Corps Fitness this Saturday for a blood drive! Remember to check out the CF Loyalty Program and Incentives we announced earlier this month: Earn points, get stuff! The KAAG CHALLENGE is ON! Let an instructor or Chris know when you want to try your hand at it! Riley is available for moral support, and Carter is always happy to yell at you to go faster! Please pardon our appearance as we rearrange and perform some spring cleaning! Lots of great changes are coming, including repurposing the spin room as part IM ABLE office and part kids room (when needed), moving spin to the former kids area. The former IM ABLE office will become a retail / social area for all CFers. Thank you for your understanding! – Effective starting NEXT week, we are putting the Wednesday 6:30PM CrossFit class on hold for the spring and summer. 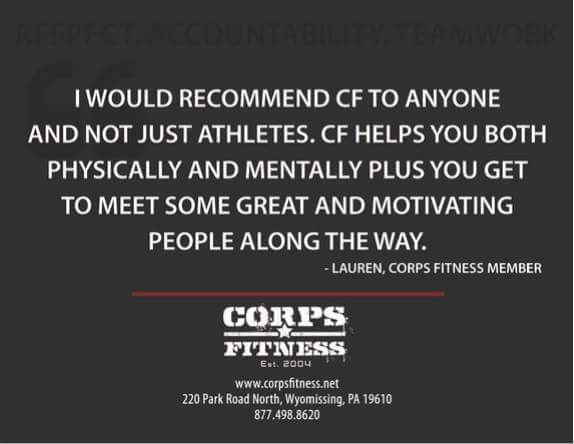 Join in the 5:30PM class to get your CF fix! – The 7AM Saturday class has been wobbly in attendance for a bit… so we’d like feedback from everyone. We still want to offer 2 classes on a Saturday, but want to know what works best for our members. Folks can reply to comments on blog, can reply to comments on FB or send an email to melissa@corpsfitness.net as per their choices. If you have a preference, PLEASE respond….if there are no responses, we will make the change ourselves, but we’d rather here from you! A great way to get in some zero-impact mileage, especially on rainy spring days!